Stephen Colbert’s set has always been an important part of his television personality, whether we’re talking about the self-praising environment found on The Colbert Report or the often projected-upon ceiling of The Late Show. Colbert also uses his space well, finding a purpose for every corner of it and effectively making it a character on the show. 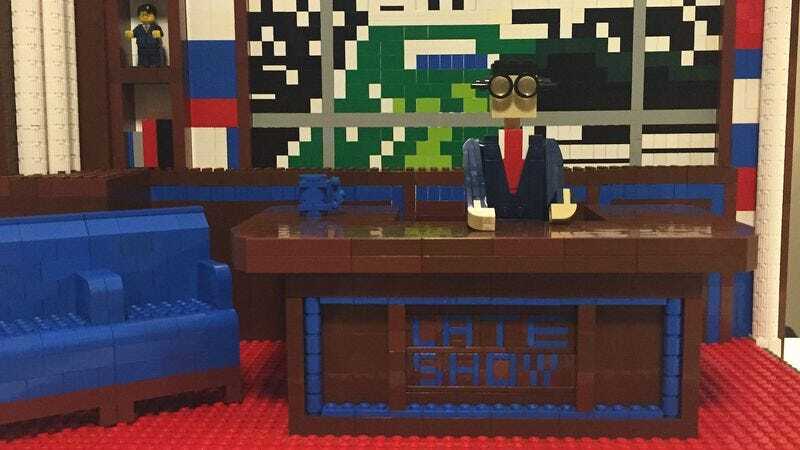 Lego artist Maxwell Bauman decided to pay tribute to The Late Show set the best way he knows how: by recreating it brick by brick with Lego. We’re not going to get on Bauman’s case for not finding millimeter-sized Lego bricks to accurately put the show’s logo on the front of Colbert’s desk, and we’re also going to overlook the fact that Colbert looks like a Canadian South Park character because considering the medium, the details are impressive, from the shelves of memorabilia on the back wall, to the coffee mug on the desk, to the perfect coloring of the couch and just about everything else. The recreation is so good, in fact, that The Late Show took notice and retweeted Bauman. Bauman has more images of his recreation on Flickr, and his Flickr page is also home to a bunch of other impressive pieces of Lego art. He has made a Dali-style melting clock that hangs over the edge of a flat surface; a bit of Bernie Sanders campaigning material; and characters from South Park, Gravity Falls, and Adventure Time.